This morning’s newspapers revealed that Havre de Grace will bypass the gr. 1 Personal Ensign Stakes in lieu of the gr. 1 Woodward Stakes. While not official, everyone’s certain that Blind Luck will stay west to do just what her rival has planned – that is, to run against males. Blind Luck’s connections believe that if she can beat males in the gr. 1 Pacific Classic at Del Mar she could be Horse of the Year. Funny, but the connections of Havre de Grace believe that the same thing could happen to her. Rachel Alexandra’s triumph over Macho Again in the Woodward two summers ago is in many people’s minds the best race they’ve ever seen at the Spa. Later that year, Zenyatta defeated males in the gr. 1 Breeders’ Cup Classic and that victory, too, became an indelible memory. One filly who’s beaten males already is Inglorious. The gr. 1 (Can) Queen’s Plate winner traveled south from her home base of Woodbine in Canada to run in the gr. 1 Alabama Stakes. She ran well in her two prior US starts, but couldn’t win either time. Yet, the public installed her as the 2-1 favorite. She lost the Alabama, of course - in fact, finished last. Royal Delta, trained by Bill Mott, denied It’s Tricky a sweep of NYRA three summer Grade 1 stakes races for three-year-old fillies. The public dismissed her as 5-1, mainly because she finished third to It’s Tricky and Plum Pretty in the gr. 1 Coaching Club of America Oaks. Mott won’t tempt convention by trying the bay daughter of Empire Maker against the other gender. The Alabama, as announcer Tom Durkin explained as the field hit the far turn, was a race with a division title at issue. There are many stories worth writing about from the races preceding the Alabama. Cribnote, a horse that dazzled Saratoga fans by breaking his maiden in a two-year-old race in July 2008, returned to action after two years, finishing third in the first race. Every year, a shipper from Finger Lakes strikes at long odds and this year it was Fox Rules in the second. Some eye-catching maidens surfaced, namely El Padrino, a fast closing second to B Shanny in the sixth as well as two first-time starters, Fantastic Song and Animal Spirits, one-two in the eighth. 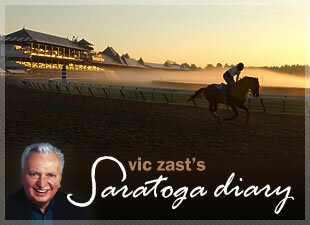 Travers candidates are burning up the racetrack in the mornings. Preakness winner Shackleford prepped Saturday and J W Blue will prep Sunday. Uncle Mo will register his last work before the gr. 1 King’s Bishop on Sunday. The $3 peanuts bag is the track’s best snack value. The Farmer’s Market on High Rock Avenue is overflowing with seasonal produce. But the corn at BJ’s stand on West Avenue is bigger and juicier. 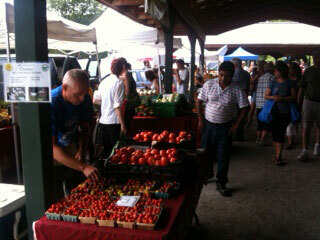 Caption: The Saratoga Springs Farmer's Market is open on Saturday mornings and Wednesday afternoons.